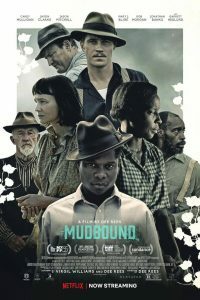 Mudbound is the first film I’ve reviewed that is currently being streamed on Netflix. Even though it’s also being shown in some theaters around the country, most of the people who see it will watch it on various electronic devices. Based on a novel by Hillary Jordan, Mudbound tells the story of two families, one White and one Black, living on a farm in the Mississippi Delta in the 1940’s. The White family, Laura and Henry McAllan, move down from Memphis when Henry buys a farm. Hap and Florence Jackson, the Black family, already live as tenant farmers on the property. When the McAllan’s arrive, they find the house they assume they will be living in to be occupied by another man, unwilling to give it up. (Honestly, I didn’t fully understand this plot development.) So they move to a much smaller house on the property near the Jackson’s even smaller house. When World War II breaks out, Henry’s younger brother Jamie enlists and becomes a fighter pilot in Europe. Ronsel, the oldest son of Hap and Florence, also enlists in the Army, where he serves in the infantry. Although neither Jamie nor Ronsel knew each other before or during the war, they develop a friendship after their return to Mississippi, supporting each other in their PTSD. After being well treated in the army, Ronsel finds it even more difficult for him to return to the Jim Crow segregation of the Delta. Ronsel has fond memories of falling in love with a German woman at the end of the War. He remarks to Jamie that his race didn’t seem to matter to the Europeans, while it certainly matters back in Mississippi. Mudbound details the ways both families deal with the hardships of being poor farmers in the 1940’s. However, there are many differences, based on race. Henry assumes that Hap and Florence will assist his family, including their children, whenever he needs them. Henry asks Florence to come work for Laura and take care of the children. Florence wants to take care of her own family and work on their farm, but knows that she has no choice but to accept Henry’s offer. When Hap injures his leg in an accident, Laura brings a doctor to treat Hap’s wound, and pays the doctor. Henry is so angry with Laura that he doesn’t speak to her for some time. To make things worse, Henry’s ornery, blatantly racist father Pap comes to live with them. He makes life difficult for all around. Hap assumes the role of preacher in the Black community. Their scenes in a shell of a church building, with their prayers and spirituals are among the best in the movie. Mudbound is beautifully written and filmed by Black director Dee Rees, from the war scenes in Europe to the muddy farmland of the Delta. Rees captures the tension of the racism which is always present, whether just below the surface or exploding into violence, as it eventually does. Be warned that there are a couple of scenes of disturbing violence in the War scenes, but also in the Delta. The racial violence impacts the lives of all the members of both McAllan and Jackson families. Rees has assembled an excellent cast of actors, including many unknowns. Among the best known are Carey Mulligan as Laura, a woman who prefers city living to farm life and singer Mary J. Blige, as Florence, who cares for her family with quiet strength and dignity. Newcomers Garrett Hedlund and Jason Mitchell as Ronsel give very good performances as the two young men returning from war. Although it’s not always easy to watch, Mudbound is well worth seeing for its storytelling and fine performances of the cast. Unfortunately, we continue to deal with racism today, and, so, Mudbound is still relevant.